Record runs of tourism have helped bring back Greece from near-economic ruin but on Santorini, it’s brought worry there are too many visitors, with cruise ship arrivals being curtailed and infrastructure under stress. The tourism sector is growing three-and-a-half times faster than still floundering Greek economy that’s fallen 25 percent in a nearly nine-year-long crisis but showing some signs of recovery, driven largely by foreign visitors. That was the finding from a study by the World Travel & Tourism Council (WTTC) which said the sector provides a million jobs in a country of 11 million people, at a time when unemployment is still the highest in the European Union, with 811,000 people jobless. The tourism and travel sector in Greece grew by 6.9 percent in 2018, compared to the previous year, significantly exceeding the roughly 2 percent GDP growth rate posted by the national economy. The holiday industry now accounts for 20.6 percent of the country’s Gross Domestic Product (GDP) of 176.56 billion euros ($200.3 billion) or about 36.37 billion euros, some $41.26 billion, a saving grace for the beleaguered economy. 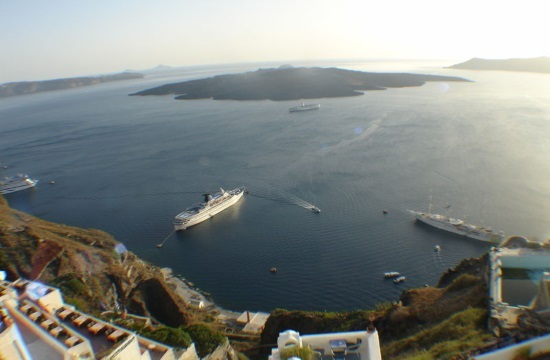 But so overwhelmed with visitors that cruise ship stops will be limited, Santorini – the number one favored island choice in 2017 – is in danger of seeing tourism ruin the reason people from around the world flock to its cliffside attractions and see a dormant volcano. That was the finding of the European Parliament’s Transport Committee in January which criticized Greek officials for favoring revenues over the island’s charms and attractions, saying it was saturated with tens of thousands of daily visits. The committee’s report, completed in October, 2018, said that, “The lack of tourism governance and strategic cooperation between local and national authorities might put the future of the destination at risk,” said Kathimerini.